Walmart and other low-wage workers are demanding higher wages, better hours and working conditions, and the right to organize without retaliation. Twenty-three Walmart workers were arrested last Thursday for blocking an intersection in Pico Rivera, Calif., outside a Walmart store in the Los Angeles suburb. Those arrested are part of a larger movement of Walmart and other low-wage workers across the country demanding not only higher wages, but better hours, working conditions and an end to corporate retaliation against their organizing efforts. The sit-down strike is an old favorite in the labor movement, and a recent favorite among the low-wage workers rapidly joining it. The tactic was popularized in the 1930s, when workers with the freshly founded United Auto Workers “sat down” on a General Motors assembly line in the company’s heart, Flint, Mich., to secure union recognition. The UAW strike was meticulously planned, after researchers found that there were only two GM plants in the country that produced the dies out of which car bodies are made: shutting down the Flint plant, Fisher Body Plant Number One, essentially meant shutting down General Motors. As labor historian Phillip Dray writes in “There Is Power in a Union,” auto makers were especially vulnerable to sit-down strikes because “manufacturing in the auto industry was based on the continuous flow of production, and the cessation of work by even a handful of men in one department could bring an entire plant to a halt.” When the strike ended after a recognition agreement was reached in early February, the UAW’s membership grew exponentially — from 30,000 to 500,000 workers nationwide in the year after the strike. 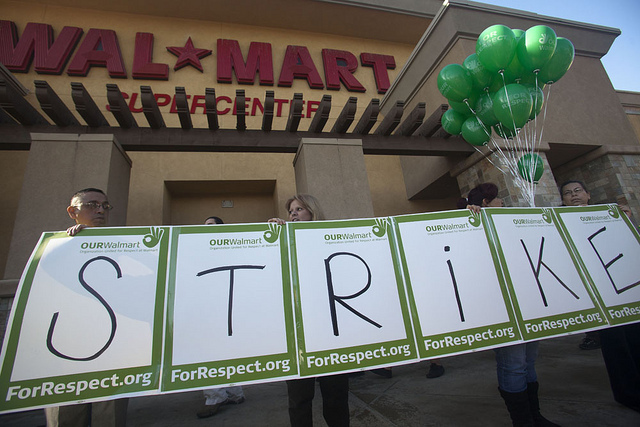 Workers have been organizing at Walmart since at least October 2012, when the OUR Walmart campaign kicked off with a retail strike spanning 12 cities. Just last month in Miami, an estimated 80 Walmart employees took part in another walkout that followed a September wave of actions in 15 additional cities. So far in 2014, workers at 2,100 stores have signed a petition calling for a $15 minimum wage, joining calls from fast food workers for the same wage floor. A few weeks ago, it was reported that over half of Walmart workers — 825,000 people — make less than $25,000 a year. A Congressional study found that the employees of a single Walmart store need as much as $1 million in food stamps each year to offset low wages. Protests center not only around paychecks, but also working conditions and hours being offered, calling for more full-time positions. Reuters reported last summer that half of Walmart stores were only hiring temporary workers, and 600,000 of the chain’s employees work part time. These high numbers of part-time workers obscure the picture painted by wage figures alone. What’s more, workers claim they’ve been illegally targeted and even fired for organizing their fellow employees. Walmart workers are also gearing up for what’s slated to become their largest Black Friday protest yet. OUR Walmart, backed by the United Food and Commercial Workers, has been holding nationwide actions on the day after Thanksgiving for the past two years, drawing attention both to the company’s labor practices year-round, along with the fact that many additional workers are called in on Thanksgiving to accommodate the company’s notorious post-holiday deals. ThinkProgress reports that strikes occurred last year at over 1,500 retail locations, with an additional nine strike actions in the lead-up to Thanksgiving. This year, organizers are expecting protests at an additional 100 stores. Like autoworkers in the 1930s, retail and fast food workers form a critical part of the American economy — no less so on Black Friday. Targeting Walmart is both a way to improve the lives of many workers, and set a new precedent for workplace organizing in an economy increasingly reliant on low-wage work.